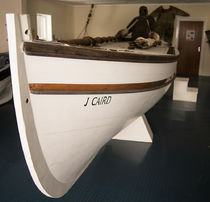 The Carr Maritime Gallery is situated in a former workshop adjacent to the Museum. It was officially opened by HRH Princess Anne during her visit to Grytviken in March 2009. 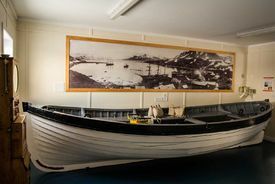 The display includes a replica of the James Caird. The original was sailed by Shackleton with five other men from Elephant Island to South Georgia in 1916 following the crushing of the ice locked Endurance. During the 16 day voyage the men faced mountainous seas, cramped conditions and extreme cold. They regularly had to chip ice from the deck to prevent it overturning. Despite only four sightings of the sun Frank Worsley charted a route for the James Caird across the most inhospitable seas to safety in South Georgia. Other highlights include a wandering albatross specimen in flight. 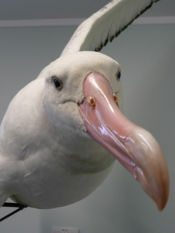 The specimen was discovered on Bird Island by British Antarctic Survey scientists after being severely crushed, possibly due to crash landing. 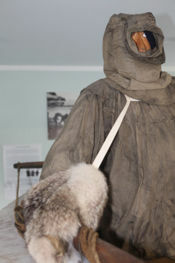 It was prepared for display by Taxidermist Steve Massam and completed in 2008. Science is also represented through displays on the Discovery Investigations which studied the marine environment around the island from the 1920s to 1950s. 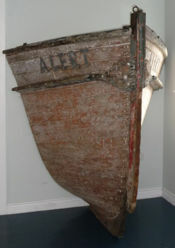 The Alert, a wooden survey launch, was used as part of the investigations to survey inshore areas in the 1920s and 1930s. The surveys were necessary in order to improve navigational charts for vessels working in the and around the bays. This section was salvaged by Sally Poncet after the Alert suffered fire damage in the Falkland Islands. 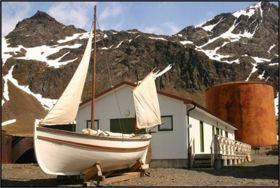 It was transported to Grytviken in 1995 and subsequently deteriorated further. 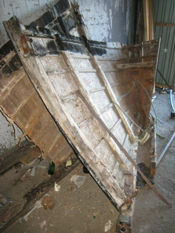 Museum Assistant Chris Moore very kindly volunteered to restore the bow section during the 2008/9 season. Alert in the Falkland Islands by Sally Poncet - Please click on essay title to view. This page was last modified 19:04, 13 September 2016. This page has been accessed 16,870 times.